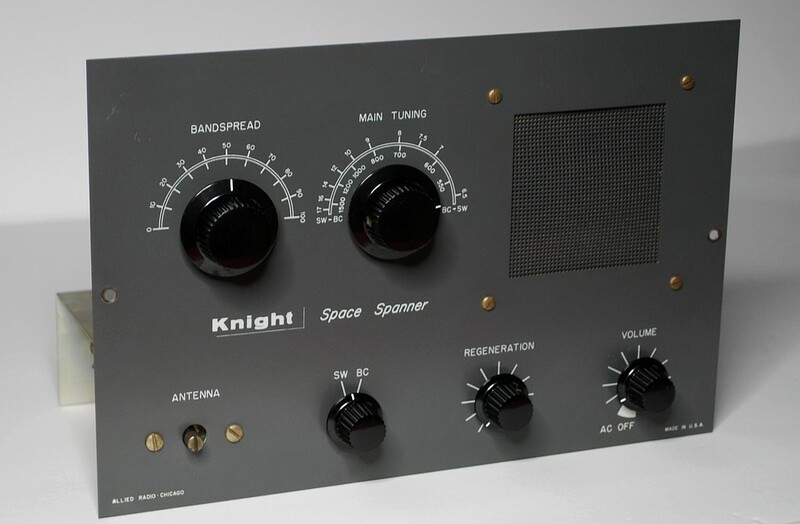 A Knight Space Spanner. This was built by James Kasper in 1957 or 1958. At the time, James lived in Philadelphia, PA. 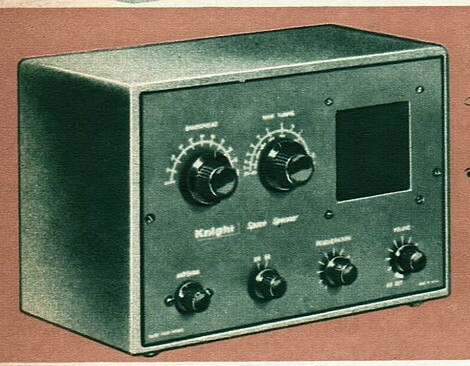 It is a regen radio and was sold as a kit by Allied Radio. Rear view. On the left is a speaker/headphones switch. Next to it are headphone jacks. The antenna connector is on the right. This was purchased on March 24, 2019 on ebay. It was auctioned by James' nephew after James had passed away. Since the builder's name was known, the intention was to leave it in as close to original condition as possible. 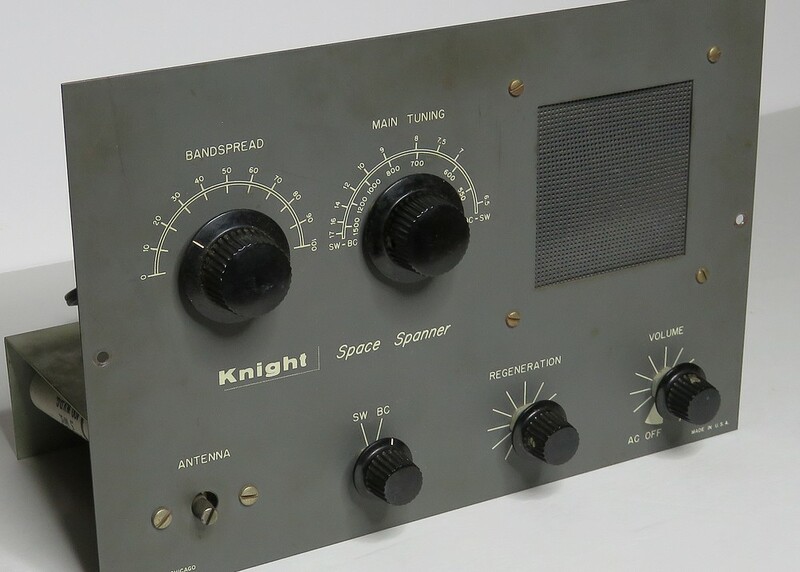 In most cases, when an old kit shows up on ebay the name of the person who built it has been lost to history. James Kasper's fingerprints couldn't be cleaned off. They reacted with the coating on the chassis. Dating the radio was relatively easy due to the fact that the Allied Radio catalogs are online. All one needs to do is spend hours looking through the catalogs! Man, they sure sold a lot of neat stuff. The Space Spanner first appeared in 1956. It was dark gray and didn't have a cabinet. In 1957 a cabinet was included. Same in 1958. 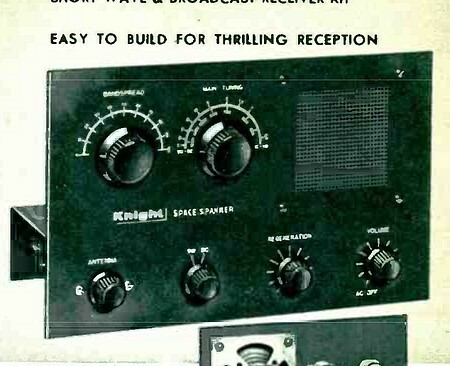 In 1959 the gray front panel was changed to a two tone panel of light gray and dark gray. The only years a solid gray Space Spanner was sold with a cabinet were 1957 and 1958. The Space Spanner had a short life of seven years. 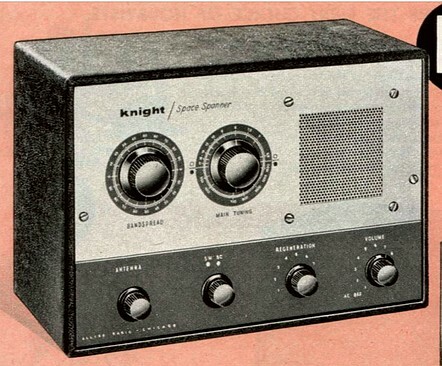 In 1963 the Knight Star Roamer kit appeared. In 1964 the Space Spanner disappeared from the Allied catalog. 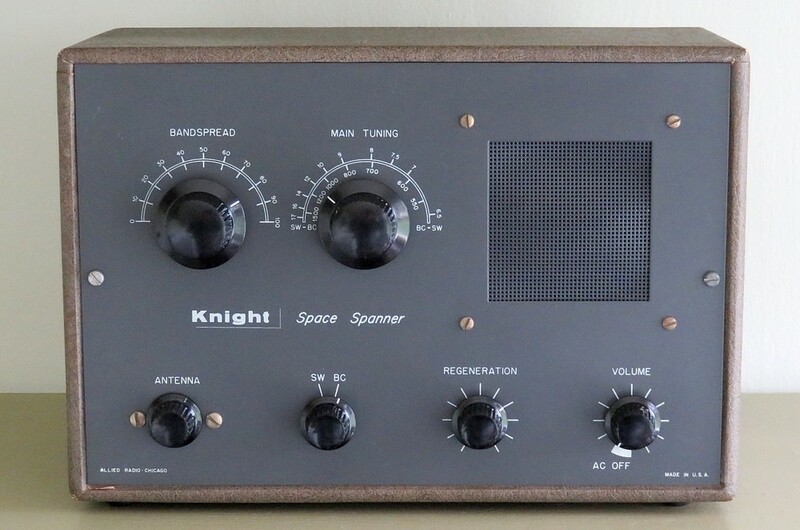 The Star Roamer was a Superheterodyne radio and had many advantages over the Space Spanner. 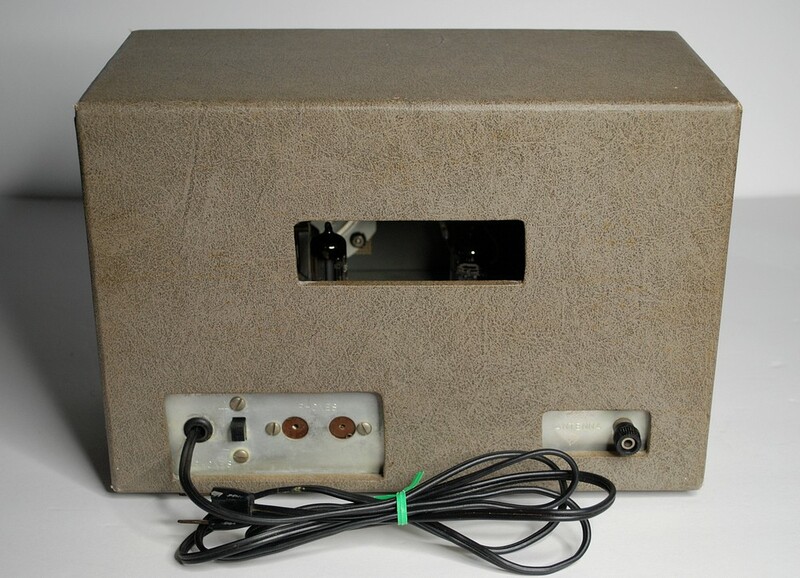 The Star Roamer was superior in almost every way, but it had three times as many parts and a price tag to match. In 1963 the Space Spanner cost $18.95. The Star Roamer cost $39.95. In 2019 dollars that's $157 for the Space Spanner and $330 for the Star Roamer. 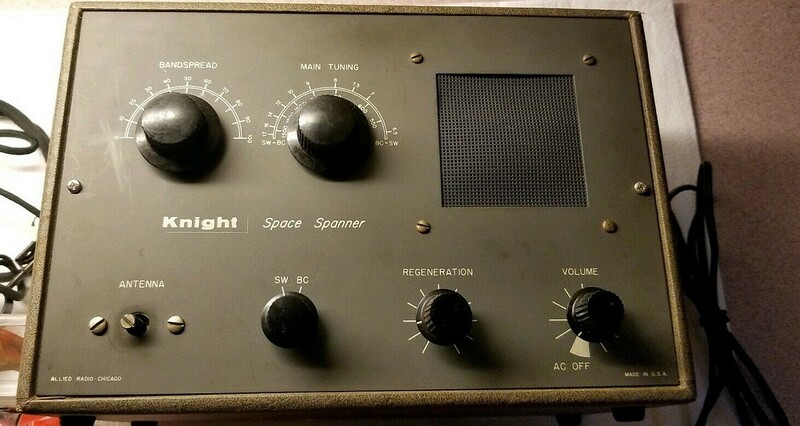 By the way, I paid about $157 for the Space Spanner, so I got it at the 1963 price! 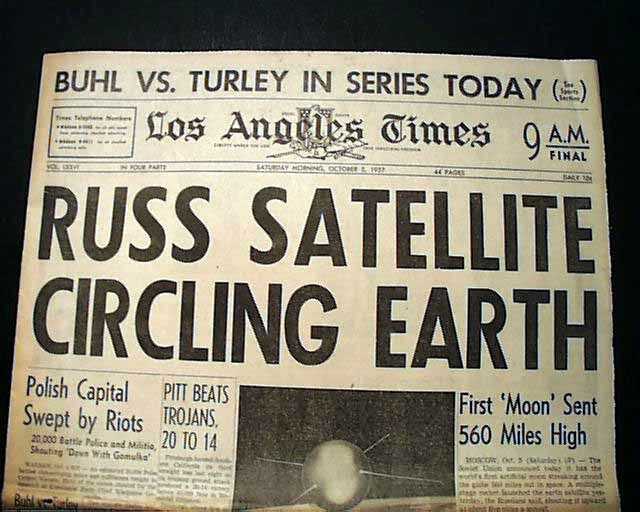 On October 4, 1957 the U.S.S.R launched Sputnik I, an event which shocked the population of the USA. A Russian satellite was passing over the country every 96 minutes, and there was nothing anyone could do about it. It could just as easily have been an Atomic Bomb. 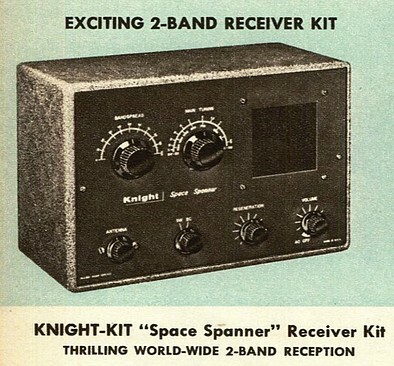 Not only could you see the booster rocket passing overhead at night, the satellite transmitted beeping tones on the shortwave bands at 20.005 and 40.002 MHz. Now let's make up a story about James Kasper. Judging by the quality of the assembled kit, James had reached an age where he had developed some skill and patience. He wasn't of job age, because if he had a job he wouldn't have bought an entry level regen radio kit. So let's put his age at 15, and he's still in high school. The Russians have launched Sputnik and you can hear it on the radio, but only on a SHORTWAVE radio. With a desire to learn everything he can about the Soviet menace, he sends to Allied Radio for a Space Spanner kit. Photo from the ebay auction. 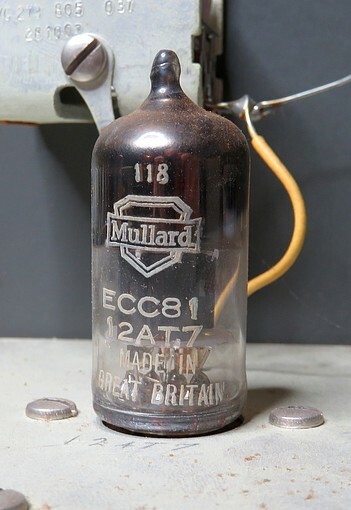 When the cabinet was removed, the first thing I noticed was that the tubes are all Mullard brand! COOL!! The front looked like somebody had been blowing cigarette smoke at the radio. 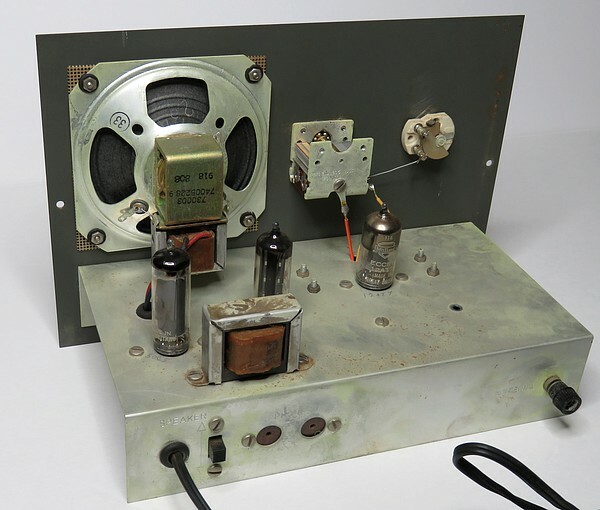 The vacuum tubes tested at 75% of what new tubes test, so this radio was used a lot. The underside looked good. Well soldered. 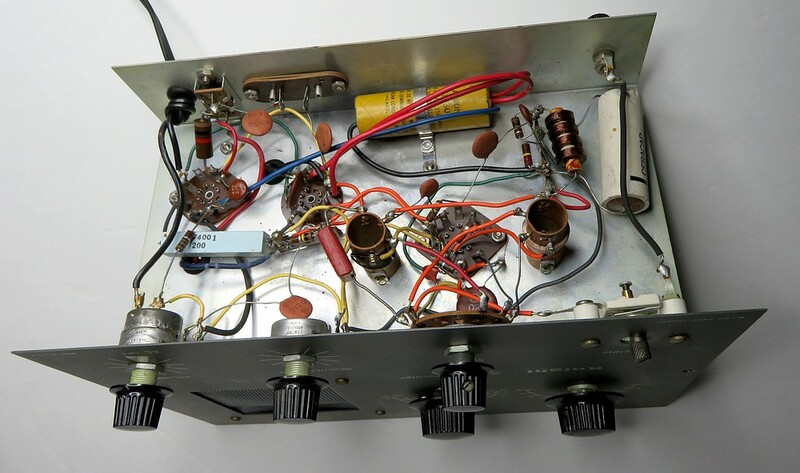 All that was needed was to re-stuff the yellow filter capacitor. Wait a minute... those shafts sticking out look a little odd. Is that the way they're supposed to be? 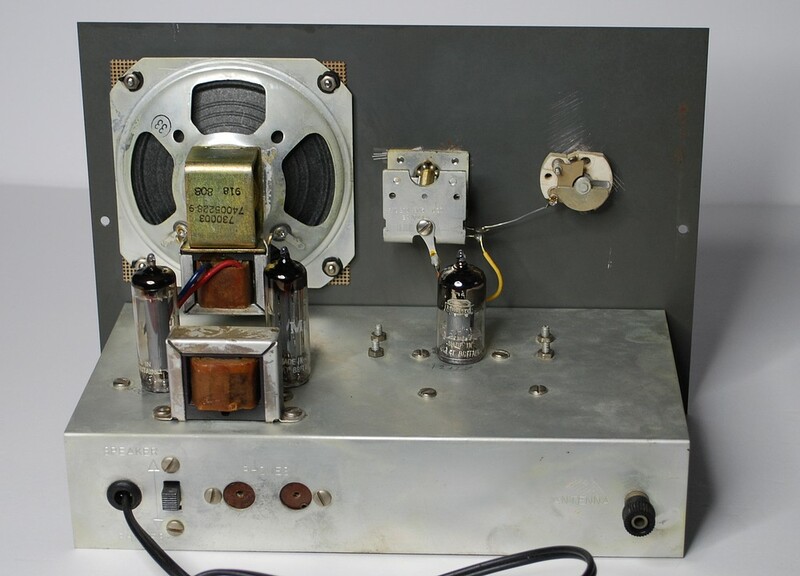 I didn't have a manual but I did have the guys on the Antique Radio Forum. I popped off a quick question.